A single sided RC paper with a beautifully neutral white base and lightly textured surface. Because of it's value for money, the Folio range is a great solution for professional creatives who want to re-print and change their books regularly. 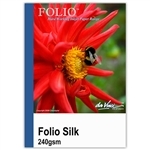 The Folio Silk is considered to have a semi-gloss finish.